A monument commemorates the tercentenary of European discovery of Tasmania by the Abel Tasman expedition in December 1642. It was at Tasman Bay, near Cape Paul Lamanon, that Abel Tasman and his crew became the first Europeans to land on Tasmania. It was here that Tasman sent his Pilot-Major Visscher, to name the territory Van Diemen`s Land after the Governor of Batavia on December 2, 1642. It is good that the spirit of men like Abel Tasman, intangible yet vital, should, give character to the traditions of a nation. When Tasmanians and prominent visitors gathered at Dunalley yesterday for the unveiling of a memorial to the Dutch explorer, many must have felt that, although Tasman's contact with the island named after him was but a fleeting one long before white settlement began, his influence has endured through the centuries, and that Tasmania and Australia are all the better for it. 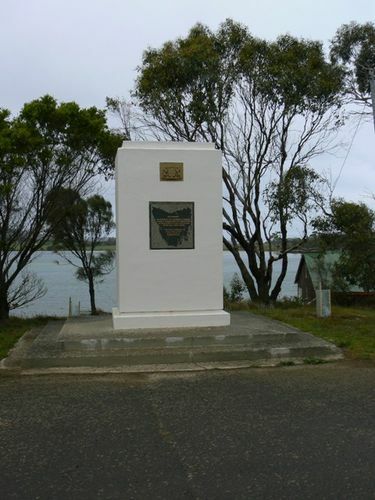 This monument was erected by the Government of Tasmania in 1942 to commemorate the tercentenary of the discovery of this island in 1642 by Hon. Abel Jans Tasman.